THE DAUGHTER OF A BRITISH NURSE MIDWIFE—the type straight out of Meet the Midwife TV series—Elizabeth Andersen inherited her passion for nursing. Her mother lived in a convent and travelled by bicycle to deliver the babies of low-income women. Why Nursing? Growing up, Andersen was immersed in stories of nuns, mothers, babies, and deliveries. 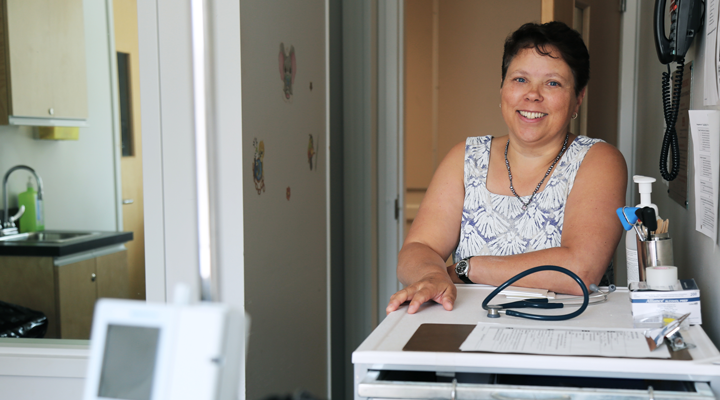 When the time came she enrolled in Zoology studies at UBC, but her heart was quickly drawn to another profession: Nursing. 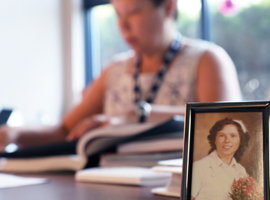 Now a successful researcher and professor at the Okanagan campus, Andersen recalls that her student transfer application was declined by UBC’s School of Nursing. Of course, that wouldn’t stop the woman who earned a nursing diploma from Vancouver Community College, became a registered nurse (RN), then earned her bachelor’s, master’s, and doctoral degrees. Before graduate school, Andersen worked for many years as a staff nurse—a career path that brought her to: surgical units at Vancouver General Hospital; pediatric nursing at Sunny Hill children’s hospital, Vancouver; surgical, pediatric and obstetrical nursing at Kelowna General Hospital; medical and palliative nursing at Foothills Hospital in Calgary; and community nursing in Calgary. Years later, she transferred again to extended care. While working in nursing homes, Andersen experienced a number of challenging situations that sparked her interest in caring for an aging population. She knew there was room for improvement, so she enrolled in a Master of Nursing program at the University of Calgary to find the information that she wanted, and needed, to help create positive change. Andersen’s devotion to improving patient care still guides her work. Her research centres on developing knowledge in the area of assistive care and health support for those aging with chronic disease and disabilities. Her passion for positive change is unyielding. The goal of many of Andersen’s research projects is to investigate the role of care aids in nursing homes. She describes these individuals as the most undervalued and under-appreciated care providers. “I would like to change that,” she says. Working with varied teams of academic researchers and health-care leaders, she is focused on identifying which staffing options will best meet the needs of both the care aides and the growing senior population. Andersen is also working on a small collaborative and interdisciplinary community project, thanks to funding from the Rural Health Services Research Network of British Columbia. This project is designed to explore the potential of developing dementia friendly initiatives in the District of Sicamous, BC. Andersen is also acutely aware of and interested in the experiences of student nurses, and has several research projects focused on undergraduate students and the nursing curriculum. No stranger to change, Andersen has witnessed the refinement of processes in hospitals, revisions of policy, and technological advancements in nursing. She believes nurses today do more with less time, and that a nursing education should reflect those advancements. In her present role, Andersen combines her experience as a staff nurse and researcher to help best prepare her students for their careers.